Be prepared to enjoy 12 -days/11 -nights of adventures on the Island of Palawan! This All About Palawan package that lets you experience the three gems of Palawan - Coron, El Nido and Puerto Princesa. This itinerary has been crafted by our Local Agency with one idea in mind: to inspire you. Every element can be adapted to your needs and your interests, from duration to accommodation and activities. Welcome to Manila! You will be picked up by our representative to take you to your hotel. You'll stay for a night to rest from your international flight, before embarking on an adventure for the next 8 days. On the way to your hotel you will be doing a quick stop to visit some of Manila’s historical spots, Luneta and Intramuros. Enjoy! It's get up and go time! Today you will be travelling to Coron, the first stop of the three main islands. You will be brought to Clark International Airport, a 2-3 hour ride from Manila, for your flight to Coron. Upon arrival in Coron, you will be picked up by your hotel’s transport service. Get settled in your hotel and you have the rest of the day to rest or explore the town of Coron. Today you are off to see 7 of the best islands in Coron, where you will see for yourself the unique beauty of the island. This is a private guided tour. Calauit Safari Day Tour includes the breathtaking scenic boat tour from Coron town, passing by the uninhabited isands of Gutob Bay to Calauit Island. Take the opportunity to feed exotic animals from Africa, such as giraffes and zebras. Learn about the endangered animal species of our province Palawan. Calauit safari is a day trip full of activities and adventure! Explore Black Island and dip into the mini pools inside a cave at the foot of the black mountain. Say goodbye to Coron and be ready to explore the exquisite beauty of El Nido. Today you will be taking a shared Ferry to El Nido – this journey takes about 4 – 6 hours depending on the waves. Upon arrival at the port of El Nido you will be picked up and taken to your hotel. El Nido has always been in the top 10, if not the top 1, of best islands in the world, and today you will find out why! The duration of the tour is about 7 hours in total. We will bring you back to El Nido port at around 4pm. During the island hopping Tour A, you will stop at Small Lagoon, Big Lagoon, Secret Lagoon, Shimizu Island and Seven Commandos Beach. Get ready for another tour around the islands. 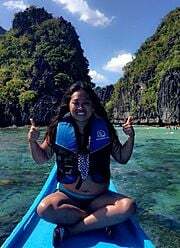 Tour C is probably the most popular of all El Nido tours. It will take you on a journey to beautiful islands, beaches and snorkelling spots, and to the unique Matinloc Shrine. Tour C has a total duration of about 7 hours, so you will be back in town around 4pm after a day filled with adventures. During the island hopping Tour C, you will stop at Helicopter Island, Matinloc Island, Secret Beach, Star Beach and Hidden Beach. Today will be a relaxed day at Nacpan Beach. Nacpan Beach is said to be the most beautiful beach in El Nido. With Calitang Beach, they are known as El Nido’s Twin Beaches. You will get to witness the best sunset you will ever see in Nacpan. Prepare yourself for a road trip to visit the last place in this itinerary, Puerto Princesa. To reach Puerto Princesa you will be taking a 6 hour private van ride with various stops. Today you can choose to do the Underground River Tour; this is usually a shared tour with other people. The park features a spectacular limestone karst landscape with a subterranean river. One of the river's distinguishing features is that it emerges directly into the sea, and its lower portion is subject to tidal influences. The area also represents a significant habitat for biodiversity conservation. The site contains a full 'mountain-to-sea' ecosystem and has some of the most important forests in Asia. After the underground river you can end the day by having dinner on the Iwahig Firefly Tour. Feel free to roam around and explore the city of Puerto Princesa. You can try their local “chaolong” (Vietnamese Noodle Soup) or eat at one of the more popular restaurants in Puerto Princesa called Ka’Lui. Reservations can be made through your hotel. Unfortunately, all good things must come to an end. This morning marks the end of your adventure. You will be brought to the airport for your flight back to Manila and subsequently your flight back to your country. You can proceed to the Airport Concierge or Passenger Assistance Desk for your connecting flight. It's not goodbye, it's see you later. Thank you very much! The price reflects this specific itinerary and is designed to give you an idea of the budget required for this destination. Throughout the trip-planning process, our local agency will tailor your itinerary around your budget.